Matroska (.mkv) has been widely used for multimedia storage thanks to its ability of holding an unlimited number of videos, audios, pictures or subtitle tracks in one file. MKV format will be your best choice for saving videos on your computer while keeping multi sound tracks. But if you want to play MKV videos on smart phones, it will be an utter pain because most smart phones are strict for video formats. Like Android phone, it only supports playing WebM, H.263, H.264, and MPEG-4 videos. Of course you can convert MKV videos to Android friendly format using a video converter program then transfer the converted files to Android phone. But it's both time and effort taking. Besides, if you have a large collection of MKV videos, your Android phone will be unable to store all of them due to the capacity limitations. The prevailing solution for this dilemma is streaming MKV to Android phone using a video streaming app, like Air Playit. By streaming, all your MKV videos stored on your home computer (PC/Mac) can be transferred and instantly played on your Android phone over air. No format converting, no file transferring and no Android phone storage requiring. To be more specific, Air Playit is a video streaming app which supports streaming MKV videos to Android phone without using video converter software. Even when you're far away from home, you can watch your MKV videos without storing them on Android phone memory. As long as Wi-Fi, 3G or 4G networks are accessible, your video collections including MKV, M2TS, H.264, AVI, MOV, WMV, FLV, MP4, etc. can be played on Android phone easily and immediately. Air Playit consists of two parts: a server installed on your PC/Mac for managing folders and streaming, and a client installed on your Android phone for playing streaming videos. How to Streaming MKV to Android Phone with Air Playit? For streaming MKV video to your android phone, you need to go to www.airplayit.com to download the server (Windows or Mac version) first, and then go to “Download Area” of http://forum.airplayit.com/viewthread.php?tid=380&extra=page%3D1 to download client for Android. 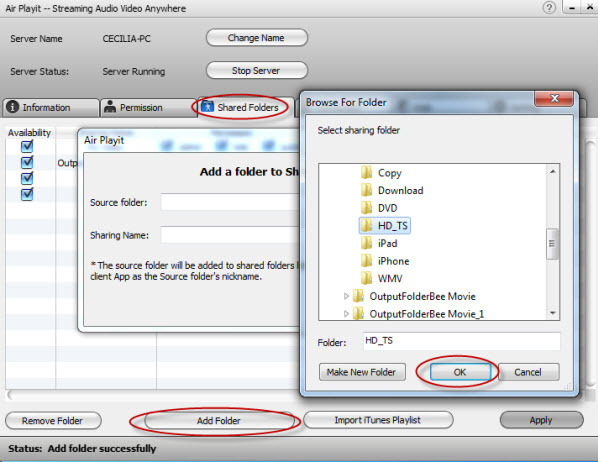 Step 1: Run Air Playit Server on your computer or Mac, click "Shared Folders" and choose "Add Folder" on the bottom to add the HD MKV video folder from your computer for streaming. Step 2: Run the Client on your Android phone. Here we take Google Nexus on Android OS as an example. Air Playit does fairly a good job in detecting local network by Bonjour Server. It also allows for manual IP address specifying. Click "+" button on the top to specify server address manually. Step 3: Find the MKV video on your android phone, and then click on it and play. You can make your personal settings by clicking "Setting", or even convert and download it for offline watching for saving your bandwidth or other purposes. 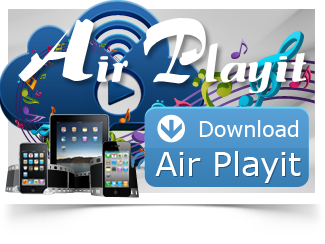 With 320 built-in audio and video codecs, Air Playit is also capable of streaming AVI, FLV, WMV, etc. videos to Android, iPad, iPhone and iPod touch without the need of video format conversion and iTunes sync. Android phones only supports H.263, H.264 AVC, MPEG-4 SP video formats. Now to play other videos, we can use Air Playit to remotely watch any video on Android by streaming videos from to Android PC or Mac via WiFi, 3G/4G network.